← What Animal Would You Be? This crime drama is so up my alley that it’s going to be hard to draft this particular entry without veering off – thanks for bearing with me! 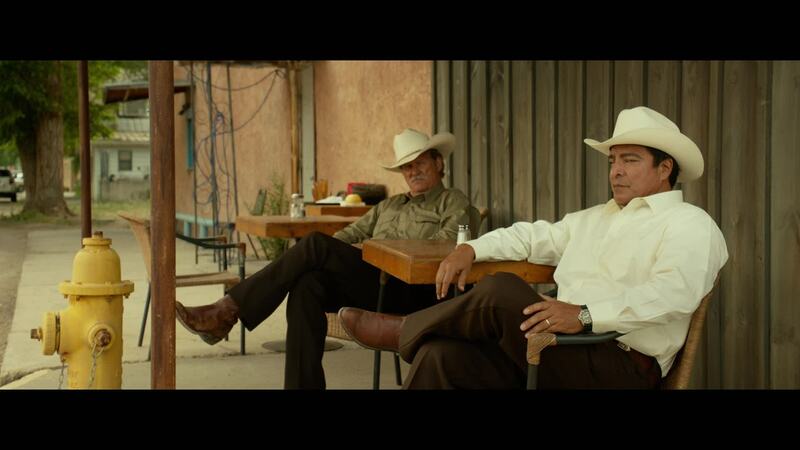 In the tradition of other purely American crime pictures like The Departed, Killer Joe, Heat and No Country for Old Men comes High Water, a film with disciplined pace, engrossing characters and a setting that is absolutely essential to its tightly wound story. West Texas is the only place this movie could have taken place. The economic reality of its main characters and the look and feel of the supporting cast all manifest themselves by the authentic, Texan locations. Chris Pine and Ben Foster play brothers Toby and Tanner Howard, respectively. The brothers are robbing different branches of the same “Texas Midlands” bank, all within driving distance of their plot of land. In the opening scene, their nondescript, turquoise colored Chevy Camaro – which is covered in dust like almost all the vehicles and props in High Water – passes behind a couple of dilapidated buildings in a dilapidated town. And if you look closely, the director, David Mackenzie, hovers on one of these buildings just long enough for us to see the graffiti scrawled on the wall, which reads something to the effect of “I’m good enough to do two tours, but not good enough for the bait shop to be open when I get home.” This kind of shot, which appropriately seasons the delicious stew that is High Water, is beautifully mixed in to the film throughout. These shots serve as constant reminders that there are a lot of Americans living in debt, who cannot support their ex-wives and estranged children, who are turning to the local casino for any kind of break rather than their elected officials, the local church or the community free store. 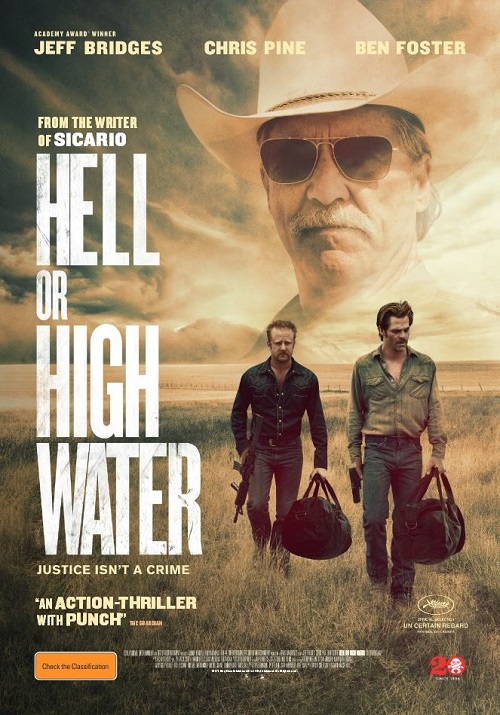 But, at its core, Hell or High Water is about two different sets of characters on a collision course. 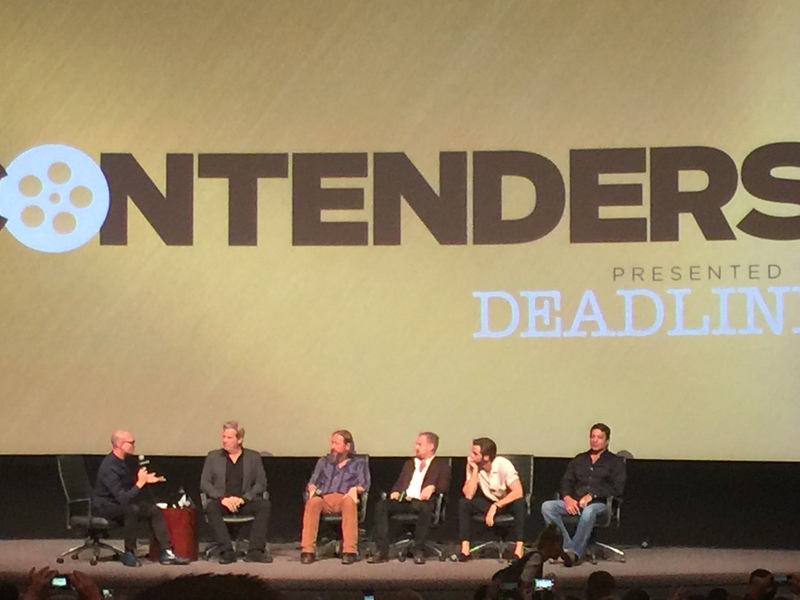 If the Howard brothers represent chaos and crime, then Jeff Bridges as veteran Texas Ranger – capitalization earned and demanded, by the way – Marcus Hamilton and his deputy Alberto Parker (Gil Birmingham), represent the law & order side. Again, this is a rich stew, and Hamilton and Parker’s exchanges are one of the essential ingredients of the recipe. We all know Bridges from his iconic work spanning more than four decades. But Birmingham as Parker deserves a lot of credit too, for his supporting effort is a fantastic foil to Bridges’ codger. I’m not going to divulge much more. There is a very good reason established for why the Howard boys have actively decided upon their life of crime. There is a very interesting pattern to what they’re doing, which Hamilton thinks he’s uncovered. There is a lot of action for such a serious drama, which rivals some of the movies I mentioned earlier. But, another reason High Water worked for me so well is its supporting characters and their language. Dale Dickey, an incredible character actor who I recognize for her turn on TV’s Southland among other roles, does a masterful job as the victim in the Howard boys’ first robbery. Acting students should watch the scene with a careful eye for her dialogue, particular accent and her body language. Another great bit part was executed by Kevin Rankin, who was awesome not only on Justified but also Breaking Bad. His one scene as a Texas bank manager is pitch perfect. And then there’s Margaret Bowman, the waitress of the T-Bone cafe where Hamilton and Parker stop in for lunch while they’re on the Howard boys’ trail. She asks, “what DON’T you want?” Like the Coen Brothers, Mackenzie has aptly used the supporting cast and extras to paint an uncannily accurate picture of the world of their film – and Ms. Bowman is one of the best examples. 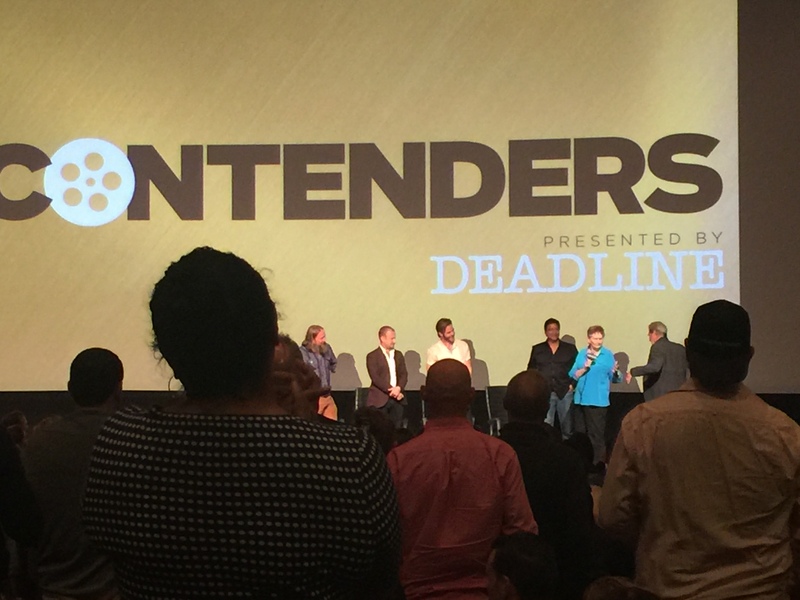 In fact, last November, I had the fortune of attending The Contenders, which is an annual event sponsored by Deadline at the Director’s Guild of America. These are a couple of pictures of the cast and crew from the film – and subsequently, Mr. Bridges welcoming Ms. Bowman onto the stage to welcome us all to a Texas barbecue lunch. 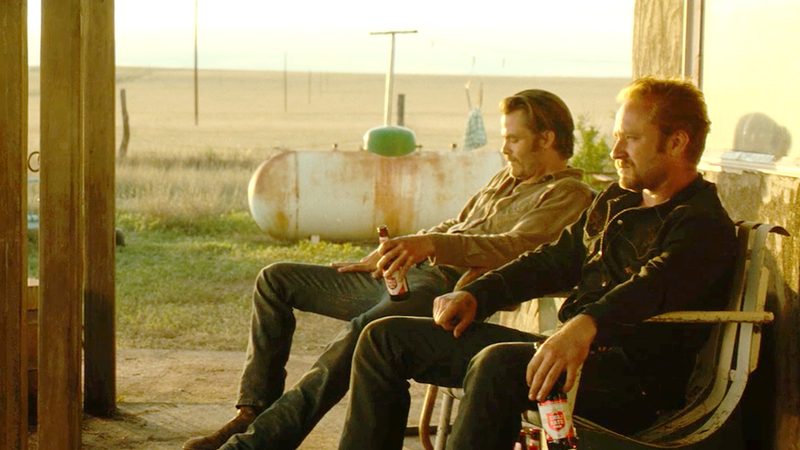 In the end, Hell or High Water is one of my very top films of 2016. I consider it an instant classic. The acting is masterful. The art direction, costumes, cinematography and music all contribute to the authentic tone of the film. And Mackenzie’s taut direction keeps us focused not only on the spirited chase, but also the reason for the chase. There are a lot of Americans with real, daily economic struggles. High Water does a helluva job of composing its theme, that some of these challenges are self inflicted, but some of them are part of a bigger, “haves vs have-nots” conspiracy. And if you have an argument about said conspiracy, I’m sure there are folks very like the Howard boys awaiting your contention the next time you pass through West Texas.